Local family blogger Christina Nicholson has gift ideas for the holiday season. Let’s shop local this Christmas! 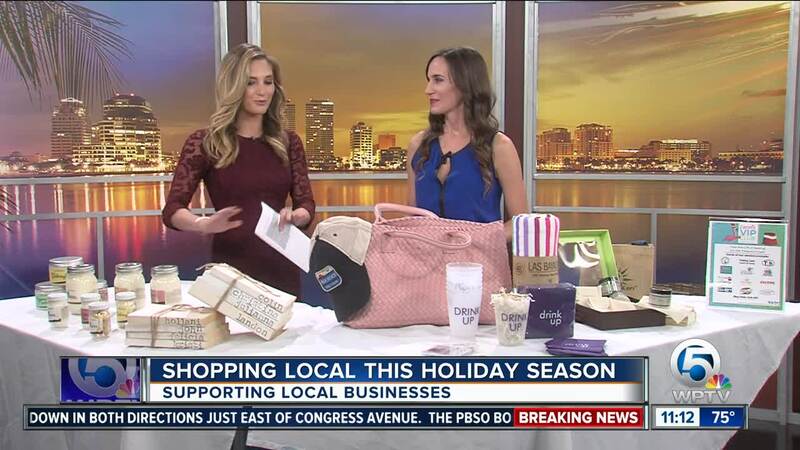 Christina Nicholson, the local family blogger behind Christina All Day , has some great products here from local business owners to make your holiday shopping, and spending, a little more meaningful this season. Raw butters and soaps for your body and hair care. This business is located on PGA Boulevard in Palm Beach Gardens and will be at all Whole Foods locations this spring. You can get a variety of scents and flavors. Jars start as low as $9. If you enter WPTV at checkout you can save 25 percent on any order. Check out Sticker Shop Unlimited for anything personalized, like these books with my family’s names and even the 11 am newsteam here at WPTV. The sets are charged per book for just $6 a book. This is a Boca Raton based business and you can find out more at StickerShopUnlimited.com . Now, let’s head to Rapunzel’s Closet and Lil Rapunzel’s in Palm Beach. You can get so many cute things there from totes, to beach blankets, to napkins, hats, and other accessories. On the second floor of The Mall at Wellington Green, Natural Kerr has all of your skincare and gifting needs because while they are a locally owned business, they carry products from around the world. For those of you on the Treasure Coast give the gift of savings. Buy your loved one a Locals VIP Club membership for just $25 and they will get thousands of dollars of yearly savings. You don't need to spend big bucks to earn publicity. You just need to know what to do. I will teach you how, step-by-step, in my free online course, Master Your PR. Sign up by clicking here!